The Night Last Night	– Mark Ronson & The Business Intl. The last two tracks don’t fit quite as well and should probably be rethought, but overall it’s a good, fun 75 odd minutes of music. Also known as our year of broken stuff. Since late last year we have had a number of crucial household appliances break or otherwise cease functioning effectively, including our vacuum cleaner, lawnmower, whipper snipper, fridge and old freezer (was kept in the garage for bulk frozen goods storage). Some of these were easier to deal with than others. The vacuum cleaner, which was a relatively cheap but pretty good one from Aldi was replaced with a new, pretty good, relatively cheap one from Aldi. The whipper snipper was replaced with a $10 pair of garden shears of the type that my Dad has always used, which look like old-fashioned sheep shears. These also work very well and are actually quite therapeutic to use. The mower can probably be repaired and I just need to get myself organised and take it to a lawnmower mechanic. The fridge is in a different order of magnitude though. Almost all of the shelves broke in the middle and temporary repairs involving super-glue, wood for bracing and/or duct tape only go so far. It was also tending to freeze the vegetables and salad things while not cooling some other foods adequately. Unfortunately it is also rather expensive to replace. Exceptionally kindly, my parents came to the rescue and offered to buy us a new fridge. About a month ago Tegan noticed a David Jones catalogue advertising 20% off all white goods. The same night she checked the Choice website and found a very recent article reviewing and comparing fridges. There was only one fridge in their survey that exactly fit the dimensions of the fridge space in our kitchen and it was one of the top five fridges as reviewed by Choice. The next day it was in to DJs and with the 20% discount the fridge we wanted was cheaper than anywhere else we could find it, including discount appliance stores like The Good Guys and Clive Anthony’s. Three weeks later our new fridge arrived. Anastasia was prepared for it and was asking about the new fridge on her way home from child care. 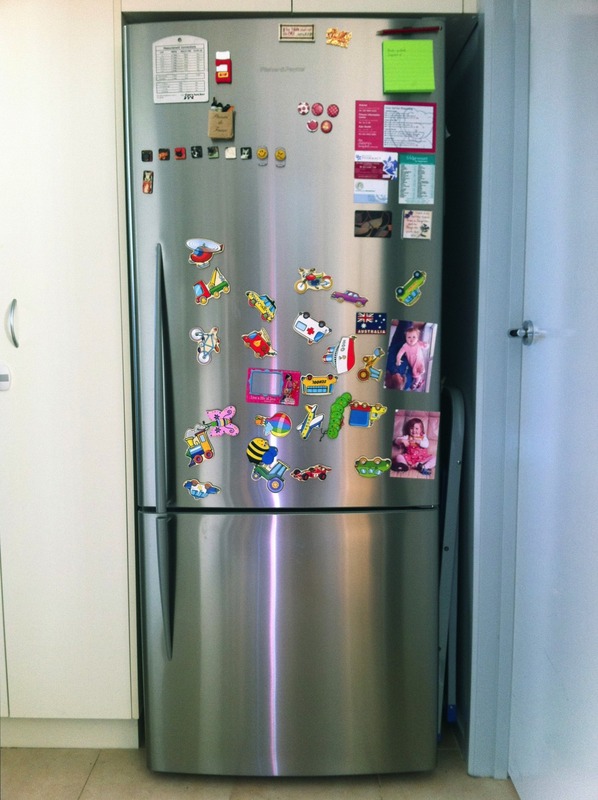 The first thing she did when she got home was rush into the kitchen to see it, followed immediately be decorating it with her magnets. Very cute. In case you want to know the gory details, it’s a Fisher and Paykel 442BRX. 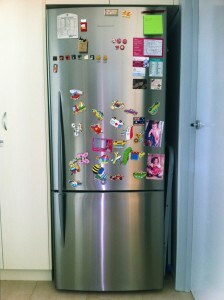 While slightly smaller than our old fridge it seems to fit a bit more. The shelves are adjustable to a number of different positions and they’re glass, so shouldn’t crack down the middle like our old ones. Because it’s an upside down fridge it also means that Anastasia can reach the freezer door and the very first time she did the first thing she noticed was one of her favourite foods – ice cream. Fortunately, she has learned very quickly that she has to ask first before she is allowed to open the freezer door. Not all new things need be boring household appliances though. I also bought a new bike. I haven’t ridden for a few years but when I was commuting to work a few years ago, I was riding my Dad’s old bike, which he bought in the mid-1980s. While it was generally quite fine, being an old bike the brakes didn’t have great stopping power, particularly not in Canberra’s fog, the gears weren’t moving smoothly and the chain would come off from time to time while I was changing gears, and all that even after I had it professionally serviced. 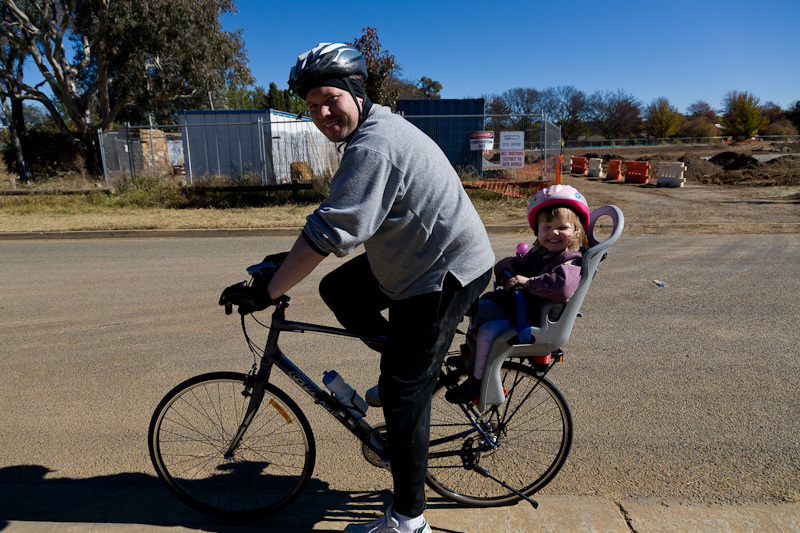 I got a good deal on a new Giant Cross City 3, fitted with a great little kids seat for Anastasia to ride in. They even fitted a drink bottle holder attached to Anastasia’s seat. Anastasia was very proud heading into the bike shop with her Dora the Explorer helmet, which she got to wear while we rode home together. Anastasia and I have been riding quite a bit – mostly just commuting into town to our (well, my) favourite coffee shop or Anastasia’s child care, though we have been for at least one really good ride down to the lake and back. Less exciting though, I’m also getting better at fixing flat tyres. Unfortunately, it also looks as though the coffee machine will be the next thing to die: oh, the horror! That may be the worst one yet. I previously said that Isaac cries lots. This wasn’t really quite true. These times are terrible and trying. Tegan and I get quite stressed by it after a while, which is compounded because it makes Anastasia quite upset too. She now often says things such as, “Isaac, stop crying!” or simply comes up to us and says “I want Isaac to stop crying”. She often asks to go out, for example to her little park, but wants the other parent to stay at home with Isaac. While she does love her little brother he obviously wears on her. Unfortunately, on the days that Isaac cries and screams the most and upsets Anastasia, her behaviour is also at its worst, characterised by whinging, crying tantrums over the most minor things and general naughtiness. Of course, this also makes things worse for Tegan and I because we then have two upset and trying children to manage. I’d say that over the past few weeks we have felt stressed and exhausted much more often than not. Egg hunt completed successfully = very happy two year old. Adults had scrambled eggs and bacon for breakfast = very yummy. But Isaac has been screaming almost non-stop since 6:45, to the extent that Tegan was trying to feed him his bottle and eat her bacon at the same time while in the shower. Poor little mite – really not having a good time. Isaac also screamed through most of the church service that morning, settled for the first part of our trip on the car to Goulburn for a family lunch, screamed for the last 45 minutes of the trip and also for about half of the afternoon, before finally sleeping the whole way home. 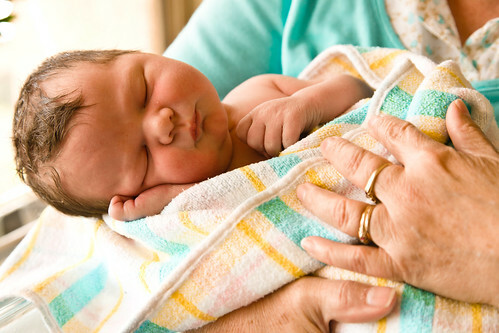 Fortunately on that day we had lots of family who were happy to help and hold him (although we may have scared some of the younger ones out of ever having their own kids), but such assistance is rare. Mostly it is just us, which really means mostly Tegan, who has to handle the screaming and try whatever we can to settle him and cope ourselves.